By Manoj Patnaik : Attesting the belief that he is a true ‘living deity’ with an astonishingly ingenuous human touch, Lord Jagannath of Puri will wheel through the common ‘death and birth sequence’, shedding his old body and getting into a new one, in a remarkably unique and mystic ceremony called Nabakalebara in the year 2015. The Chief Administrator of Lord Jagannath temple in Puri confirmed to this effect as two months of Asadha (Joda Asadha) is reckoned to occur in the year 2015. When two months of Asadha fall in one year, the famous Ratha Jatra (Car Festival) is observed as the festival of ‘Nabakalebara’. The highly anticipated ceremony will be hosted after a long interval of 19 years, the last Nabakalebara being held in 1996 and only three other witnessed since independence, in the year 1950, 1969 and 1977. As the word suggests, Nabakalebara signifies ‘New Embodiment’, when Lord Jagannath along with Balabhadra, Subhadra and Sudarshan shed their old body in the form of the wooden images they have been getting worshiped as, and get into the new ones. The old deities are buried within the temple premises at a place known as ‘Koili Vaikuntha’, Koili meaning ‘burial ground’ and Vaikuntha meaning ‘heaven’. 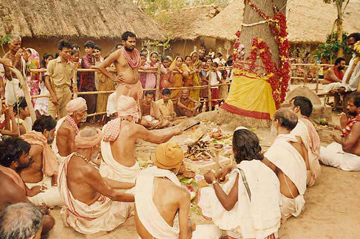 The rituals associated with Nabakalebara are extremely esoteric and performed with utmost secrecy and devoutness. They are based on ancient Sanskrit manuscript Niladri Mahodaya, Rudra Jamala, Tantra Jamala and Brahma Jamala. The new images are made from Neem wood to be brought from a holy tree with special attributes. The tree must be growing in a cremation ground with a temple of Lord Shiva and a pond nearby. The trunk must have grown straight without branches until 12 feet and there on, must have only three or four branches. The tree should be having a termite abode and must not have nested by birds. The ceremony kicks off from 58 days before the annual Ratha Jatra in the Joda Asadha year, with a select group of temple worshipers (Sevakas) leaving in search of the holy tree to be used for carving the new images. The group led by Pati Mahapatra includes among others Daitapatis, Viswakarma Maharanas and Lenkas. The group with Aagyan Mala from Lord Jagannath (a 12 ft. garland believed to be carrying the ordain of the lord) heads for Kakatpur Mangala temple about 80 kms. from Puri on way to Konark. Goddess Mangala is believed to reveal the exact location of the holy tree to the oldest Daitapati who sleeps inside the temple. The whole uncut trunk of the holy tree is then brought to the temple on a wooden cart and kept inside Koili Vaikuntha. The three oldest of the Viswakarma Maharanas assisted by more than 50 others are engaged in sculpting the images for next 21 days, completely walled from outside for next 21 days. The new deities are carried by Daitapatis to the inner sanctum and placed before the old images for the most auspicious and rigorous ‘transformation ceremony’ (transfer of ‘Brahman’ or the ‘life force’ from the old to the new deities) held three days prior to the Ratha Jatra. Three oldest members of the Daitapati family carry out this extremely secret rite. The entire temple is sanitized off from any human presence and the entire city is blacked out of light for the night. Devotees across the city plunge into devotional songs and kirtaans. It is only after mid-night the most esoteric of all rituals takes place. Following table provides the details of the place from where the sacred Neem trees found for the Deities in previous Nabakalebaras. Following are the prerequisites which are required for the trees to qualify as the sacred tree for the Nabakalebara deities. 1. They must have a wheel (chakra) sign on them. 2. Poisonous snakes like Cobra must be hiding under them or in nearby ant hill. 3. A tamarind tree must be in the vicinity. 4. A funeral yard in the vicinity of each tree. 5. Each tree must have 4 to 7 branches over the main trunk. 6. From ground level upto 10/12 feet it should be straight and solid. 7. No nest of birds on treetops.